My Pinnacle Network recognizes region’s best connectors with Networking Ninja Award winners – My Pinnacle Network . Others nominated for awards include: David DeBlasio of Deblasio Marketing located in Stoughton, MA and My Pinnacle Network-Mansfield; Alex Bungener of Customers at the Speed of Light situated in Cotuit, MA and My Pinnacle Network-Marshfield; Jay Nuss of Jay Nuss Realty of Braintree, MA and My Pinnacle Network-Braintree Third Thursday; and George Rohlfing of Brookline Transportation based in Hanover, MA and My Pinnacle Network-Braintree Third Thursday. Additional nominees included: John Cotton of First Citizens Federal Credit Union based in Fairhaven, MA and My Pinnacle Network-Bourne; Gary Weinman of Marcum located in Needham, MA and My Pinnacle Network-Westborough; Sheldon Prenovitz of ABResources situated in Westborough, MA and My Pinnacle Network-Westborough; and Juddy Vedder of Web Image Designs headquartered in Shrewsbury, MA and My Pinnacle Network-Westborough. “Networking, sharing information and opportunity, is what makes the world go round,” noted Dubin. “Both whimsical and pragmatic, the Networking Ninja Awards provide recognition for many who typically do great deeds and humbly hang is the shadows.” For information about the Networking Ninja Awards, please visit www.MyPinnacleNetwork.com, or contact Steven V. Dubin at SDubin@MyPinnacleNetwork.com or 781-582-1061. My Pinnacle Network, the business to business networking group with monthly meetings in Bourne, Braintree, Mansfield, Marshfield, Newton, and Westborough, MA, recently announced the winners of its first annual Networking Ninja Awards. The newly minted Networking Ninja Awards were created to recognize the region’s best networkers in four separate categories: Best Connector (helping bring people together); Most Ubiquitous (appears to be at every networking event); Most Altruistic (does most for others); and Brightest Beacon (adds energy to networking events). Greg DeSimone, owner of Catapult Advisory Group located in Mansfield, MA took home the honors as Best Connector. He is a member of My Pinnacle Network-Mansfield. Mitchell Zucker of ConnectPay based in Concord, MA won the Most Ubiquitous Networking Ninja Award. He is a member of My Pinnacle Network-Braintree Third Thursday. 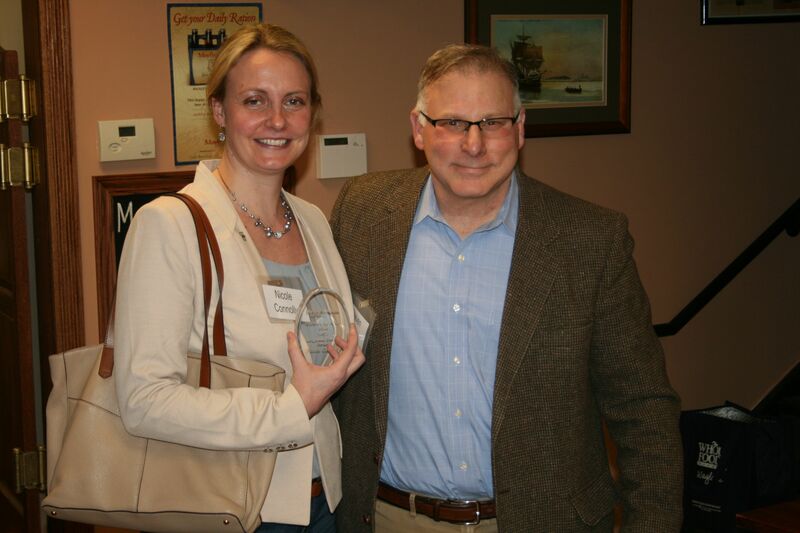 David Allen, owner of Balance Wealth Advisors situated in Wellesley, MA won the Most Altruistic Networking Ninja Award. He is a member of My Pinnacle Network-Westborough and My Pinnacle Network-Newton. Nicole Connolly of PhotoFabulousYou based in Westborough, MA won the Brightest Beacon honors for the second consecutive year. She is a member of My Pinnacle Network-Westborough. Voting for the Networking Ninja Awards took place from January 1 through February 29 on the My Pinnacle Network website, www.mypinnaclenetwork.com. Others nominated for awards include: David DeBlasio of Deblasio Marketing located in Stoughton, MA and My Pinnacle Network-Mansfield; Alex Bungener of Customers at the Speed of Light situated in Cotuit, MA and My Pinnacle Network-Marshfield; Jay Nuss of Jay Nuss Realty of Braintree, MA and My Pinnacle Network-Braintree Third Thursday; and George Rohlfing of Brookline Transportation based in Hanover, MA and My Pinnacle Network-Braintree Third Thursday. Additional nominees included: John Cotton of First Citizens Federal Credit Union based in Fairhaven, MA and My Pinnacle Network-Bourne; Gary Weinman of Marcum located in Needham, MA and My Pinnacle Network-Westborough; Sheldon Prenovitz of ABResources situated in Westborough, MA and My Pinnacle Network-Westborough; and Juddy Vedder of Web Image Designs headquartered in Shrewsbury, MA and My Pinnacle Network-Westborough. For information about the Networking Ninja Awards, please visit www.MyPinnacleNetwork.com, or contact Steven V. Dubin at SDubin@MyPinnacleNetwork.com or 781-582-1061.